Visit our C8 stand to receive our special offers and love! You can receive our 15-20 minutes short but powerful sessions at a special price. - If you book 32 DNA Activation & Energy Balancing Combination sessions in advance, we will offer you one free MBS guest pass (12 pounds value) for you to enter for that day you book. ----- Conditions are 1) Available slots for this is Fri 10am-12noon, Sat 10am or Sun 10am. 2) Non-refundable. 3) You allow us to send an E-ticket from the ticket management software which MBS uses. (you won’t receive any promotional messages from them). 4) Deadline of booking and payment is May 21st 12 noon. ----- Booking: please email us. First come, first served. u Core 24/26/28/32 DNA Strands Activation – Highly recommended. - Open up your gifts, power and fulfill your divine life purpose. More DNA is activated, you will receive more light and open up further your gifts and power. - Become grounded and balance your energy, emotion and have a peace of mind. You need to have a balanced state of mind to have a happy and joyful life. - Highly recommended to receive this together with DNA Activation. - Cut negative cords, stop draining energy and restore your energy for your divine goal achievements. Good for healing damages caused by divorce, break-up, any other emotional and mental troubles. - Partial Cord Cutting – if you want to know what cords are there which are bothering you and cut off. - Full Cord Cutting – If you are not bothered what sort of cords are there but want to cut off as many as possible. - Express what you are distressed about emotionally. You will become healed and will gain peace of mind and calmness with powerful crystal stones and Reiki Healing. - Experience how powerful it can heal and ease your physical and emotional distresses. - Original Japanese Usui Reiki has not been modified at all so it retains the authentic Reiki connection and its healing power. - It works on your mind, emotion and body. - Become healed and lighter emotionally and mentally by energy clearing and healing for your Aura. - Release tensions and pain from your head, your shoulders and upper back. You can also receive a massage combined with Reiki Healing. - Have you ever heard that you have all the answers within you? Qualified personal performance life coach can support you to find your divine answers, solutions, directions with awareness and for you to move on forward. - Release blockages, frozen painful memories and experiences, any negative emotions and become lighter and happier with what you desire. Life is too short to get stuck in painful and miserable feelings and memories. - You will receive sessions from the professionally qualified and well-trained therapists. Looking forward to meeting you at our C8 Stand. - (Bond St/Covent Garden/Liverpool st). Running Access Bars - 32 points on the head that when gently touched can contribute to changing anything that isn't working and will create greater ease and joy. Active Silver is a family business, manufacturering the finest quality Colloidal Silver, Colloidal Gold and related products to improve health, skin conditions and aliments for people and animals. Aura-Soma products and Consultations. AEOS skincare products and treatments. An opportunity to talk to our fundraisers about how you can help Cats who have been abandoned, through education on neutering, our sponosorship or lottery campaigns. Colour Flow Activewear garments are ethically made in Brazil, inspired by colours. It's a gentle therapy that encourages the body to heal itself. There is no manipulation of bones or muscles. Through light contact, the therapist senses the subtle rythmic motions of fluids that surround the brain and spinal cord and that circulate throughout the whole body, also sensing areas of restriction. The therapist then encourages a deep healing process. Everyone from babies to elderly can benefit from it for a wide range of conditions. When not used for a condition, this therapy is also used to enhance wellbeing. The retreat focuses on yoga, with complementary classes in meditation and mindfulness. It also offers craniosacral therapy sessions. Beginners are welcome as well as those who want to deepen their practice. There will be time left to explore the beautiful surrounding nature, with option to do it in group or on your own. The house is conveniently located at 8 minutes walk from Windermere train station. Daniel is training with A.C.H.O to qualify in Crystals healing, he loves crystals and runs workshops on their properties. Adam is the eye for detail and creates the stunning stall displays DanRox are known for in the SouthWest. We will be bringing our large selection of handpicked Crystals and Stones, Spheres, Lingam, Freeforms, Wands, Galets, Palmstones, Tumbles and More. Unique Flower, Shamanic & Sound Essences & Spritzers: Aborigional Flower Essences of Australia, Flowers of the Orient DNA, Jaguar Shamanic Essences, Soundwave chakra Essences & 10 x Pure CBDA oil, Spirit of Beauty Skincare. Clare G Harvey International Author & Flower Essence Expert. G&G Vitamins was founded in 1965, and is still a family owned and operated business. With a combined staff experience of over 200 years, G&G Vitamins has become a leading manufacturer of supplements in the UK. Our FDA-approved ISO Class 8 cleanroom in the heart of the Sussex countryside is powered by 100% green energy. We offer a wide range of vegan, organic and specialist products, including our best-selling, organic and vegan Kid's Rainbow Food supplement. Get A Drip will be at Mind Body Spirit throughout the weekend to give festival goers a natural boost with their affordable Vitamin Drips and Booster Shots. Visit the state of the art mobile clinic to get energised for the yoga and fitness classes with an Energy Drip or Fitness Drip. Or if you fancy something different, try a range of our other drips including our Beauty Drips, packed with beauty boosting nutrients or our Multivitamin Drips, to give your immune system a nudge. We defend the natural world and promote peace by investigating, exposing and confronting environmental abuse, and championing responsible solutions for our fragile environement. Climate change isn't inevitable. We have the knowledge, skills and technologies to get ourselves out of this difficult situation. All over the world people have woken up to the threat, and are working to reduce the use of fossil fuels, stop rainforest destruction and get power from clean energy. High quality hand carved jade and semi precious stone jewellery with silver fittings with many lucky words and meanings. Collectable Netsuke figurines in many unique designs. Exotic clothing and accessories. Visionary photographic and digital art depicting the intersection between reality and dreams, the trans-dimensional, for meditation, spiritual awakening and for more unusual home decor. Inspired by science fiction and fantasy elements, the mystical, the ethereal and the psychedelic. Subject matter includes nature, the cosmos, ancient sites, Buddha and the angelic realms. We have carefully designed and created a unique range of yogic and spiritually inspired accessories, handpicked with love from the corners of the East as powerful healing tools to help balance the mind, heart, spirit and soul, allowing inner transformation and connection to your true self. Treatments : Our body stores memories of past trauma, environmental stress, toxicity and suppressed emotions, which cause us to feel out of alignment with our lives and ourselves. We offer taster treatments to experience the power of Life Alignment to release stuck energies and receive clarity and well-being. Products : The Vortex products consist of potentised magnetic cards, each with its unique energy frequency to help transform trauma and blocked energy and to bring the body and environment into balance. This powerful technology provides personal protection from environmental toxicity and the array of electronic devices we use in everyday life, balancing our personal space within our homes and workplace. Award winning Certified Organic Skincare range that uses the rare and unique Bulgarian Rose Otto Oil. Alteya Organics is a family-owned company that have a commitment to quality and sustainability, and source all ingredients from their own farms or local community. A range of transdermal magnesium skincare containing ultra pure, high concentrations of natural magnesium, combined with other elements to produce body oils, bath salts, creams and lotions for optimum benefit. Premium Organic Mushroom capsules and powders formulated by renowned researcher and TCM practitioner Martin Powell. Living Nutrition is a practitioner formulated range of award winning supplements using the ancient knowledge of fermented foods and herbs to create this range of Herbal supplements and Symbiotics. A range of Grass-fed collagen supplements mixing traditional foods with scientific advancements to create health products that taste great, are easy to use and get results. Using hemp grown on a family farm in Slovenia, Hemptouch have created a range of therapeutic skincare containing their Premium quality, pure CBD oil. Zen CBD is a collection of naturally flavoured CBD sprays and oils in a variety of strengths designed for use on the go. Flaska is a glass water bottle that is funky and practical. Using TPS (Technology of Programming Silicone) Flaska converts regular tap water into Structured water. It is your personal water spring, helping you drink better water and use less plastic! THE WORLD MOST ADVANCE AND ONLY ENERGY RODS WITH PLANETS AND DIVINE FREQUENCIES INSTALL WITHIN . COME AND EXPERIENCE THE POWER HELD BY THE ANCIENT HIGH PRIEST ,PRIESTESS AND INITIATES . Books, DVDs, CDs and lots of free literature will be available on our stand. This book really makes Sense of Life as it reveals we are copies of our parents; DNA is not like a book of instructions. The information that copies mind and body is a quantum flow that continues into later life, where thoughts flow from mind to mind known as telepathy. In this way the paranormal is understandable, from ghosts to mediumship and dowsing, even the evidence of reincarnation. Marconics is Evolution of Energy Healing for Ascension. At MEYA, we do meditation differently. MEYA Mind Journeys deliver meditation with purpose. We use the power of music to switch you into a meditative state.Once there, we deliver goal- focused messages that are effortlessly absorbed - and actioned - by your brain. It’s modern alchemy mixed with life coaching, and it works, with carefully calibrated beats creating the soundtrack that will awaken change. Your journey to transformation starts here. Modern Ancient is a holistic self-development and fully licensed shamanic center located in the Peruvian Amazon rainforest. Now hosting a unique London program! Our products promote the health benefits associated with copper and the mindful consumption of water and food. This is done through mantra’s and prayers engraved on our products used in unison with the healing stones set in pure silver. Allowing us to form a deeper connection with the food and water we consume. Natural by Nature Oils manufacture and supply Pure and Organic Pure Essential oils, Skicare, Facial Oils, Body Oils and aromatheropy products. We also offer a range of Oil Burners and Aroma Diffusers. All of our products are made with the purest of ingredients and none of our products are tested on animals. Newton Wood crystals provide a simple, effective way to boost your health, energy and wellbeing, as part of your daily routine. Made from 100% natural, organic Epsom salt, Newton Wood crystals help soothe aches and pains in muscles and joints, aid recovery and relaxation, and add a new depth and power to your regular hair and skin care routines. Real Remedies serve up a range of highly-tuned alcohol free botanical Plant Spirits, Chakra teas, tinctures and apple cider vinegar based tonics. Their products use the plants as tools for attaining greater sensitivity, awareness and balance in our lives. selling ethically sourced and organic clothing. The Reina London brand uses positive messages to uplift, inspire and encourage women. Beautiful crystals, hand selected from around the world. We also have an exclusive designer range of jewellery. Soul Stones: individually hand painted Art inscribed with words. Choose your own message of love, joy, comfort & support, inspiration or commemoration. I love to connect. Contact me alexis@soulstones.co.uk, 07722 997719 and we can co-create the perfect stone for you. Call with any idea, or no idea at all! Check out the “words” section of my website…it’s very exciting…quotes from many inspired thinkers & writers. A Spirit Encounter brings power, revelation and healing. As you anchor your soul to the Highest you will rise to your full potential! All our Baltic Amber products natural handmade..
help calming stress depression and the infection and mush mush more..
E22 Stephanie J King - Soulpreneur ? Tesla Metamorphosis seminars could change your life for ever! Leaded by Anya Petrovic, the founder, internationally recognised teacher, author and speaker, you will unleash your healing abilities. Tesla waves are unique for this modality. Clients report healings from diseases that are considered incurable, even from birth deformities, after only three sessions. The effect of Tesla Waves on elevating the human consciousness is even more important. All students manage to create communication with their clients on the level of the conscious, subconscious and integrative mind, though they were not aware of such their abilities before. Free session experience at the stand. 10% discount if you book at the Festival. Improve Your Health. Change Career. Help Others. CNM students and graduates come from all walks of life, professions and backgrounds. Studying at the College of Naturopathic Medicine can lead to a rewarding, flexible career that can enhance people’s lives towards better health. Over 80% of our graduates are practising. And now CNM brings its leading natural health training concept to you via its new online learning platform for Nutrition and other exciting courses. Find out more visiting out stand! Hypnosis and hypnotherapy training videos and courses and individual hypnosis experiences. My Healing is focussed on Self-awareness and Healing by which I use Shamanic Healing Techniques. The aim is to release emotional blockages and to let go of negative belief systems that no longer serve us. Some of these patterns are developed in childhood through conditioning and are often linked to ancestral influences or past life experiences. The 30min taster sessions on the days will be gentle, loving and invigorating. Our amazing range of 'How To' kits are made by Zen especially for you! Each kit comes with instructions. We offer: Hows to meditate, How to sleep easy, how to balance, how to perform a moon wish and how to manifest love. Only £10 each! Large selection of king size cotton throws in esoteric and spiritual designs. £15 each or special show offer 2 for £25. Wide range of Nag champa and high quality Indian incense available. £1.50 each or 4 for £5. Come and play The Transformational Truth of Tarot Game Changer! Access the answers you hold within. Dissolve blockages like fear, worth, and doubt. Start manifesting the life you've only been living in your dreams - today - all by having fun playing a game! @stand A26 opposite Crystal Clear. The right type of filtered water can promote better health. The Wellness Water filter's unique process combines world class filtration technology with a scientifically designed volcanic mineral ‘energising’ cartridge enhanced with rare properties to replicate nature’s own spring water process which restructures ordinary tap water into great tasting, healthier, naturally enhanced ‘living’ water. The Wellness Water filter is in my own home and I regularly recommend the system to anyone who cares for their body in a conscious way. “Gudrun Jonsson – Leading Global Naturopath, Biopath and Author of “The Gut Reaction"
The Wellness Filter® is the ultimate water purifcation and enhancement system. Imagine having better-than-bottled-quality water flowing from every tap in your home including the bath, kitchen, and garden. 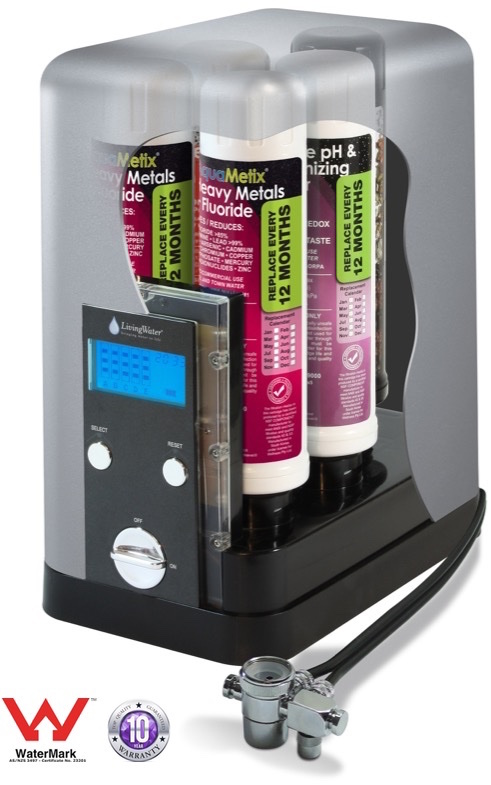 The Wellness Filter® technology utilizes a patented magnetic enhancement stage that increases the rate at which water will move through membranes such as our cells, which results in higher rates of hydration and cellular detoxification. Many experts believe that increased cellular hydration and waste removal is the ultimate answer to improved health and anti-aging. This process also temporarily improves solubility and ionic stability of the water, which allows a more thorough absorption of dissolved nutrients and the reduction of scaling with hard water. Unlike traditional water filters, the Wellness process has two distinctly different systems — a purification system and an enhancement system. They work together to produce clean and refreshing water in much the same way as the Earth does by sifting through multiple layers of natural, purifying materials. This Wellness process produces clean water that is so natural and nourishing for the body that many call it... the Best Source of Water on Earth®. The process is so exceptional that over 100 Japanese hospitals, many operated by the Japanese Ministry of Health, use it and as a natural result, many physicians recommend it for their patients. Now you can enjoy this same top quality of water throughout your home. Wellness Filter products employ a variety of specialized media to reduce harmful contaminants. The configuration and selection of these media depend on the specific product but include the finest coconut shell-derived granulated activated carbon as well as proprietary carbon block materials to reduce chlorine, chloramine, VOCs, lead, mercury, THMs, cysts, and turbidity. The whole house system also employs SPG sand (an engineered volcanic sand so effcient that it is used in Japan to purify blood for dialysis patients). These layers treat a broad spectrum of harmful contaminants and also polish the water for optimum taste. After completing purification, water proceeds through multiple layers of enhancement media. Several of these layers are comprised of unique far-infrared ceramics sandwiched in between two layers of magnetite and ceramic magnets. The far-infrared ceramic contains Tenko-seki, a rare stone which imparts reduced ions into the water. Reduced ions are known to neutralize free radicals on and in the body. Free radicals are believed to be a primary cause of aging and disease. The water also proceeds through a layer of Bakuhan stone, a rare igneous rock that contains a combination of over two dozen minerals which are eluted into the water in trace levels. It was shown that these trace minerals assist numerous bodily functions and this prompted the Japanese Ministry of Health to distinguish and certify Bakuhan as the first and only natural stone to be classified a medicinal mineral. The water is then treated by a layer of Taicho stone, another rare Japanese mineral known for its bacteria-static and fungi-static properties. As the water exits the Wellness Filter it is given one final stage of treatment with highly polished natural quartz, a material that has been shown to improve the hydration of water. Water leaves The Wellness Filter® enhanced with rare properties found only in the world’s most renowned natural springs.